Wintry, magical, sparklier than ice. 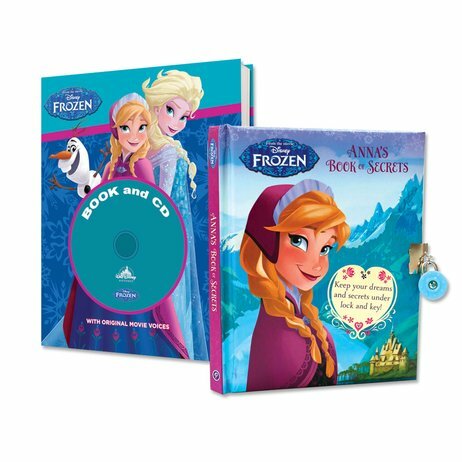 Two beautiful novelty gifts: one secret scrapbook/diary and one storybook and CD. Movie magic all wrapped up. Hurray: it’s Christmas! The perfect time to join Anna and Elsa on their wintry quest. So we’re bringing you some really special ways to enjoy the magic all over again. Anna’s Book of Secrets has special sections to fill with your own dreams, wishes, photos and scrapbook keepsakes. Don’t be shy: paste them all in! Next, the book and CD lets you relive the entire Frozen story in beautiful colour pictures and real film voices. Count us in.